Grettel Navas of the Fundación Neotropica* in Costa Rica introduces the notion of Blue Carbon. Article reproduced by kind permission of Fundación Neotropica. Carbon capture. Greenhouse gas emissions. Compensation. Climate change. These and other concepts are repeatedly used in academic discussions, in expert forums and press articles around the world. But they are also used in everyday conversations about the state of our planet and its future. Only recently, however, has the concept of Blue Carbon been introduced in official discussions on climate change. It was the Prime Minister of Papua New Guinea who, based on a global study carried out on the carbon fixation of marine and coastal ecosystems, presented this concept to the international community at the United Nations. Parallel with the concept of Green Carbon (stored in the forest and the ground), Blue Carbon can be defined as that stored by different marine and coastal ecosystems ̶ for example, plankton, bacteria, seaweed, marshland plants, mangrove swamps and other wetlands. It has been found that these contain five times more carbon than tropical forests and are therefore hugely relevant to the fight against climate change. In Costa Rica, for example, in light of the government’s commitments to achieve carbon neutrality by 2021, attention is refocusing on these mistreated and forgotten ecosystems as an intelligent strategy. Whilst it is true that marine and coastal ecosystems make up only 0.05% of living biomass, they store an important quantity of carbon in the earth since they are the most intense carbon sink on the planet. Historically the coastal ecosystems have been undervalued and unjustly called ‘swamps’ or ‘unhealthy marshes’. This has given the green light to their systematic destruction. Unlike the capture and storage of carbon in the earth (where it can be locked away for decades or centuries), carbon storage in the ocean can last for thousands of years. This much has been confirmed in a United Nations Environmental Programme report: “of all the green carbon captured annually in the earth ̶ that is carbon captured for the process of photosynthesis ̶ about 55 per cent is captured by marine ecosystems” (Falkowski et al, 2004; Arrigo, 2005; González et al, 2008; Bowler, 2009; Simon et al, 2009). The idea behind seeing blue carbon separately and giving it a different name is that it is able to highlight the importance of coastal and marine ecosystems, because in many international forums on carbon and climate summits, the role of the oceans has often been minimised or unnoticed. In rescuing its role in climate change we can carry out conservation projects of wetlands, protection of the oceans and protection of different ecosystems. 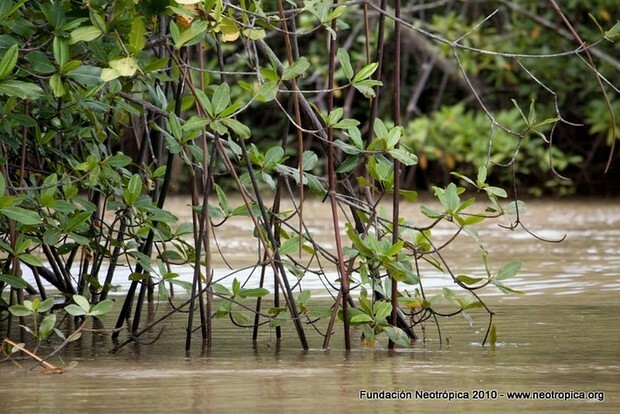 From 2009 the Costa Rican Fundación Neotropica, aware of the importance of these resources, has continually worked on programmes of community conservation of mangrove swamps. In addition to raising people’s awareness of the importance of the mangrove swamps bordering the Golfo Dulce, the Mangle-Benín project resulted in the strengthening of these areas with the planting of around 100,000 mangrove plants and established environmental clubs with primary school students. The project had strong local support through local organisations and schools, achieving a community-wide management of mangrove areas. Moreover, with the project ECOTICOS, the ecological economics of the Térraba-Sierpe National Wetlands for the community, Costa Rica and the world were assessed. This wetlands area houses the largest area of mangroves of its kind in the American hemisphere, which even by conservative estimates, produces environmental benefits to the value of $10,000 per hectare p.a..
Another important initiative has been the Wetlands Life for All campaign held in conjunction with other organisations and institutions such as Apreflofas, the School of Biology at the University of Costa Rica and student associations at the major state universities. Through this campaign they look to achieve a greater awareness of the importance of these coastal ecosystems, the benefits that they provide and the need for their effective conservation. In Costa Rica, despite all its important conservation initiatives, a significant number of mangrove areas are not designated as Protected Wilderness Area having only the general declaration that the law affords to wetlands. This creates a great deal of uncertainty on the future of their management and conservation. These ecosystems are fragile and under constant threat by pressure from production activities, sedimentation and climate change, amongst other factors. This is true in the case of the mangrove areas of Golfo Dulce for example. In the fight to counteract climate change, the application of the concept of Blue Carbon and the conservation of coastal and marine ecosystems becomes an urgent action, both beneficial and vital, being an extremely important link for all sectors of society: environmental organisations, social movements, government institutions, academics, private companies and concerned individuals, all committed to conservation.